"I am a survivor. But I am not alone." Voltage Pictures has released an official trailer for a super weird, out-of-nowhere sci-fi film called Singularity, in reference to the theoretical "singularity" moment within computing / technology. 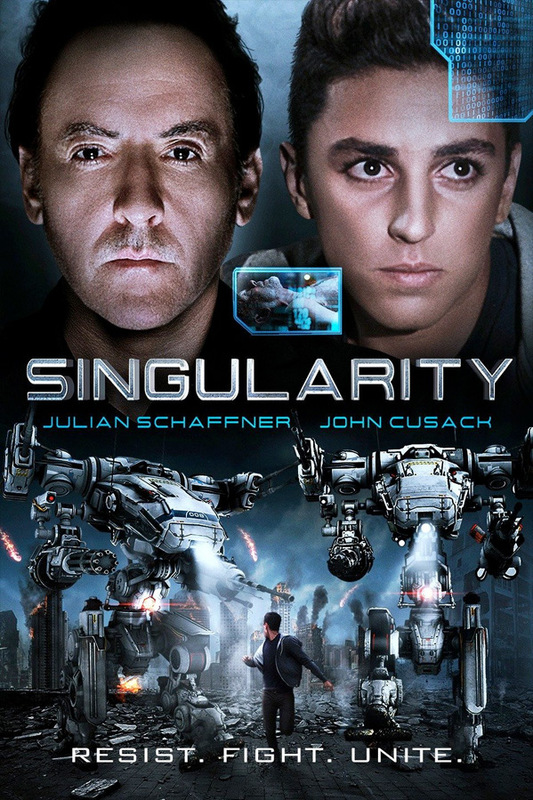 John Cusack stars as the CEO of a company that is about to released a "super computer designed to end all wars." Surprise! The computer determines humans must be eradicated, and unleashes an army of robots upon the world. This is less like Transcendence, much more of a Terminator rip-off meets Transformers meets Divergent, or something like that. The cast includes Julian Schaffner, Jeannine Wacker, Eileen Grubba, and Carmen Argenziano. It can also be filed under why-is-John-Cusack-making-such-terrible-movies, since it looks as bad as they come. This is one trailer worth skipping. In 2020, Elias van Dorne (John Cusack), CEO of VA Industries, the world's largest robotics company, introduces his most powerful invention--Kronos, a super computer designed to end all wars. When Kronos goes online, it quickly determines that mankind, itself, is the biggest threat to world peace and launches a worldwide robot attack to rid the world of the "infection" of man. Ninety-seven years later, a small band of humans remain alive but on the run from the robot army. A teenage boy, Andrew (Julian Schaffner) and a teenage girl, Calia (Jeannine Wacker), form an unlikely alliance to reach a new world, where it is rumored mankind exists without fear of robot persecution. But does this world actually exist? And will they live long enough to find out? Singularity is directed by Swiss filmmaker Robert Kouba, making his directorial debut after a number of acclaimed sci-fi short films. The script is by Robert Kouba, based on a story by Kouba & Sebastian Cepeda. Singularity is now in select theaters + on VOD today, November 3rd.